It’s pretty much a guarantee that you like fried food, but what if you can enjoy your fried treats without loading up on fat? That’s the promise of the air fryer—a kitchen product that takes most of the oil out of frying so that you can enjoy a much healthier version of some of your favorite foods. Sound to good to be true? It isn’t, but that doesn’t mean that all air fryers are equal. There are plenty of products on the market which can make it difficult to find one that suits your needs. That’s where we come in to help. 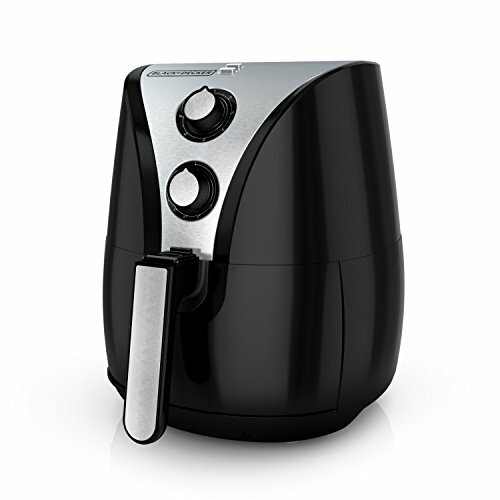 Read on for the best air fryer buying guide. In the proceeding paragraphs we are going to be taking a look at several really great air fryers, but if you would like a spoiler, the Phillips comes out a little bit on top here. It’s intuitive, dishwasher friendly, and it has even earned the approval of the notoriously difficult to please Gordon Ramsey. Of course, that’s just my opinion. You can decide for yourself which of this innovative new kitchen appliances you like best when we dive into our list. You will recall the Phillips from earlier when we chose it for our top pick on this list. Let’s now dive deeper into some of this awesome product’s features so that you can decide for yourself if it lives up to the hype. You can use the Philips to fry, bake, and even grill, which is going to allow you to get tons of use out of it. All too often you see fancy expensive new kitchen appliances hit the market that makes lots of promises but ultimately yields very little use. That’s not what you are getting here. 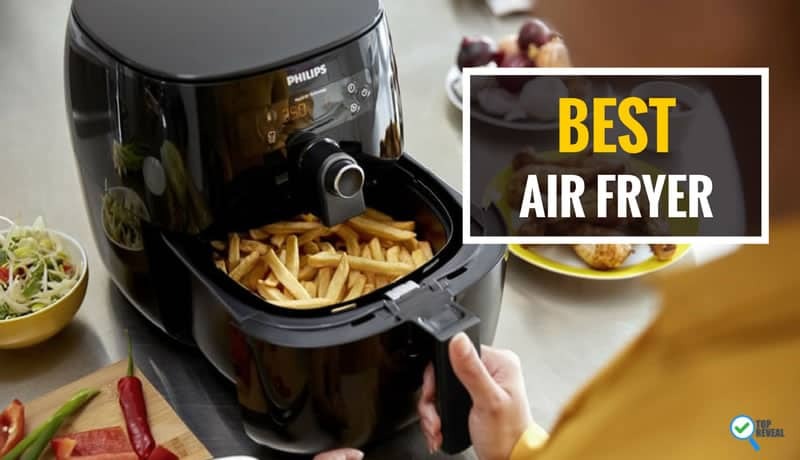 The Philips air fryer can do essentially anything that a regular pan can do, but it does it without adding the fat, calories, and cholesterol of lots of oil. This unit features a unique, patented starfish design that ensures your food cooks evenly in the basket. In other words, if you load the basket up with fries, you can be sure that every single one of them will be cooked to crispy perfection. This is a great featured because it both allows you to make the most of the baskets three-quart holding capacity, and it ensures that no one in your family is going to be left disappointed by soggy fries. If you are like me, you avoid handwashing dishes at all costs. It’s a huge drag, and the dishwasher just makes it unnecessary. Unfortunately, products like these often are not dishwasher safe but that isn’t a concern here. When you’re done cooking you can simply let your dishwasher handle the cleanup. There are a couple of drawbacks to this unit. For one thing, the basket could be a little bit bigger. If you have a big family you are going to need to cook in batches. Also, depending on what you are cooking, and how full the basket is, you might find that cook times are a little bit longer than the manual suggests. All things considered, these are relatively mild concerns, but they might be a turn off to some people. This large unit is loaded with useful features and is available at a price that many shoppers are sure to find appealing. Let’s once again take a closer look at some features to see how they stack up with your needs. Cookbooks are the best. I know that you can get recipes online now but there is still nothing quite like flipping through a cookbook and discovering an idea for dinner that you would never have otherwise even thought of. This cookbook is of particular value because it comes with fifty recipes that are designed specifically for use in an air fryer. The Avalon features one of the largest baskets on this list. 3.7 quarts isn’t going to be enough to cook a turkey in, but it should make meal prep for a midsized family a breeze. I always hesitate to list the price of an item as a positive or negative thing. After all, affordability is an extremely relative thing and price fluctuates often enough that it’s always hard to say just how budget friendly an item is anyway. 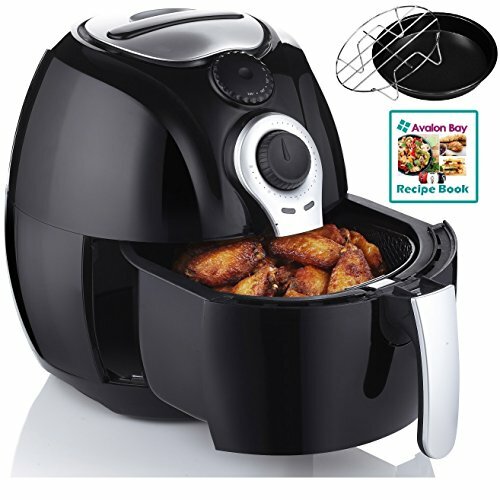 All that said, the Avalon Bay air fryer consistently comes in on the lower end of the price spectrum, which is why we have made it our value pick on this list. 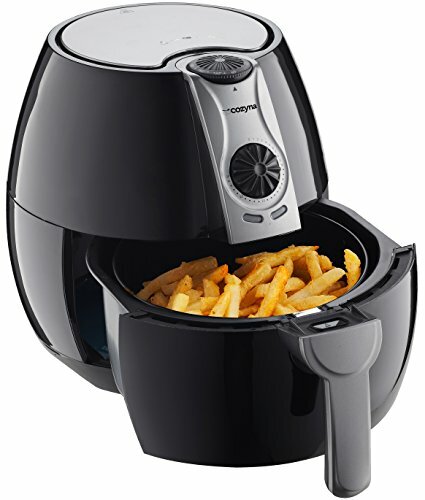 If you want a great airfryer that isn’t going to break the bank, this is an excellent opportunity to get one. One notable setback that is worth mentioning is that this unit isn’t quite as easy to clean up as the last airfryer that we looked at was. You are going to need to be careful to dry all the parts after wiping it down because if you don’t you may experience rust after only a few months of use. You don’t want that. This next unit may not be huge (which is why we have selected it as the perfect choice for personal use) but it is nevertheless just as efficient and innovative as some of the other options that we looked at. Of course, don’t just take my word for it. See for yourself! Like the Phillips unit that we looked at, the Black and Decker makes special efforts to ensure that your food is cooked evenly. In this case, even cooking is accomplished by a couple of fans that distribute the heat to all of your food. No one wants soggy fries, and you don’t need to worry about them here. A lot of these fryers feature a thirty-minute timer, which I find a little bit limiting. Plenty of dishes take longer than thirty minutes to prepare, so in order to make them on those fryers, you will need to make sure you are able to reset the timer in time. That’s not an issue here. The longer timer will make it easier to cook a wide range of dishes. The indicator light on this unit turns on when you have reached your desired temperature so you don’t need to worry about playing the guessing game. You will always know exactly when your fryer is ready to go. One of the primary flaws of this unit is in its size. While it is going to be great for personal use, it will not serve a family, or even a couple very well at all. Those cooking food for more than just themselves are going to want to invest in a larger fryer, or accept the fact that they will have to cook their family’s dinner in small batches. The Cozyna is a larger unit that will give you plenty of room to cook food for your entire family. 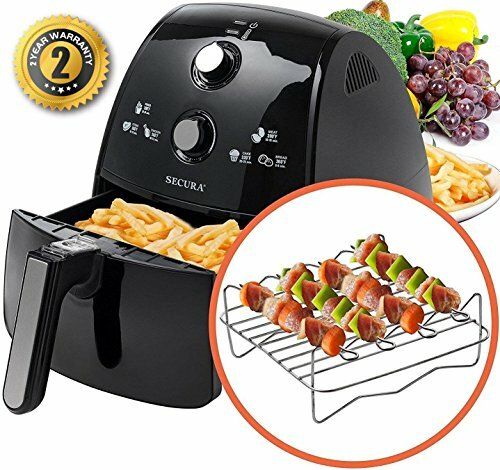 In addition to frying, it also empowers your to bake or grill, which makes it a great all in one option that is capable of taking care of all of your cooking needs. The versatility of this unit is why we have selected it as the best all in one unit on the list. While all of these fryers are empowered to a certain extent to bake foods as well as fry them, the reality is that most of these fryers are best at air-frying. This unit is able to excel at a more versatile range of cooking options because of its size, its heat dispersal, and its timer length. As a result, you are going to be able to prepare pretty much any meal that you can think of in this unit. With a maximum temperature of up to 392 degrees, you are going to be able to provide a quick, crisp cook to all of your favorite foods. A high temperature is important to frying foods because it helps to keep the outer layer crispy without drying out your meal. At 392 degrees, you shouldn’t have any problem accomplishing that. Like I said earlier, I love a good cookbook. With this package, you get two of them—both specially designed to give you recipe ideas that are specific to the capabilities of your new air fryer. The cookbooks are going to make it easier than ever to bust out the new fryer the day that you get it. This air fryers biggest setback is that it is a bit of a pain to clean. As far as product faults are concerned, this is a relatively mild issue it’s definitely still worth mentioning. The final air fryer that we will be looking at is also the largest which is why we have chosen it as the best option for larger families. Let’s one last time look at the features to see if this unit is right for your needs. With a capacity of 4.2 quarts, you are getting a fryer that that should have no trouble preparing your entire family’s food. While you may still need to prepare your meals in batches depending on how much food you are cooking, the sheer size of the basket on this unit is going to make it a lot easier to prepare food in bulk. “Rapid hot air” is their phrase, not mine. What it means is that the air on this unit cycles very quickly to ensure that your food is cooked evenly. This is particularly beneficial when you consider the size of the basket. In the case of the Secura, more quantity is not coming at the price of quality which is always nice to see. Everyone likes accessories, right? The Secura comes with skewers and a toaster rack that will make it easy to prepare kabobs, as well as a variety of other food items. These extra accessories are going to make it easier than ever to prepare a wide variety of dishes. While all of these features are great, it is worth noting that the coating on this unit could be cause for some concern. After extensive use, you may experience some chipping, which does compromise the integrity of the appliance somewhat. 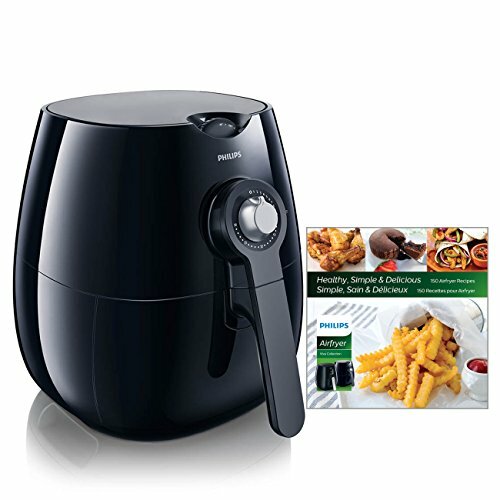 Now that you have an air fryer, you are natural going to want to use it. Here are a few recipes to get you started. Fried catfish is delicious, quick and easy. Here is how it’s done. To fry up some catfish in your new appliance you will need a point of fish, two cups of cornmeal, a pinch of salt, and a tablespoon of paprika. You will want to mix your dry ingredients in a plastic ziplock bag, then place the fish in the bag and toss to coat. After that, cook your catfish at 350 degrees for about ten minutes. Then you’re done! Enjoy your fish! Everyone likes fried chicken, right? Here is how it is done. First, you will need two pounds of bone in chicken. Then, combine four cups of flour, one teaspoon of salt, one teaspoon of pepper, and one teaspoon of paprika in a bowl. Next, dip your chicken in the coating and coat it. When all of your chicken is coated, place it in your fryer and cook at 375 degrees for around fifteen minutes or until fully cooked. Can you prepare raw food in these appliances? Yes! Just make sure that it is cooked through before you serve it. Does the food actually taste fried? Good question. Thanks to the very small amount of oil used with each batch of food, these dishes do taste fried even though they don’t have nearly as much fat. Do these products require cook spray? While these products do not technically require cooking spray it will make them easier to clean later, and it may make your dishes turn out better. Well, as you can see there are plenty of products out there. Do your research, choose the one right for your family and then enjoy a product that will literally change the way you cook.